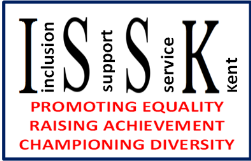 Inclusion Support Service Kent (ISSK) is a traded service which provides specialist support, training, advice, coaching and mentoring to schools, settings and professionals working with children, young people and communities. Our main focus is on raising the achievement and improving the engagement, wellbeing and inclusion of vulnerable learners specifically Minority Ethnic pupils, Gypsies, Roma or Travellers and those with English as an additional language (EAL). The Inclusion Support Service Kent are accredited Stonewall Partners supporting schools to meet the needs of their Lesbian, Gay, Bisexual and Trans (LGBT) pupils and equipping staff to tackle homophobic, biphobic and transphobic bullying. The Equality Act 2010: What does it mean to your school or setting?